For more information regarding our services. Is AA&A registered with the Autorité des Marchés Financiers (AMF)? Allard, Allard & Associés is registered with the securities commissions of Québec (AMF) and Ontario (OSC) as a portfolio manager, and as such, is entitled to advise clients on all types of investments. All our managers are registered as representatives. Are client portfolios held at AA&A? Our clients’ accounts are held under their own name at a brokerage frim or a trustee: RBC Dominion Securities or NBIN. Under no circumstances are our clients’ investments or money held at AA&A. Our clients’ assets are always at the trustee's (RBC Dominion Securities or NBIN), ensuring the utmost security. For deposits, our clients send their money directly to the broker, and the broker transfers withdrawals directly to our clients. AA&A never hold any cash or stocks for their clients. Stocks are held in the name of the client by the primary custodian (RBC Dominion Securities), which is the only agent authorised to make deposits, issue cheques or make transfers in the name of the account beneficiary. What are AA&A’s management fees? Our management fees are billed at a rate that varies from 0.6 to 1.0% annually, based on portfolio size and asset allocation. For non-registered accounts, our fees are tax-deductible. Families with a total portfolio of over $5 million are eligible to a discount. This policy has the obvious advantage of having management fees directly proportional to portfolio growth, unlike the traditional-broker system, wherein commission is their brokers' main income. Since 1995, AA&A has been engaged in discretionary portfolio management for a clientele comprising private investors from all walks of life. What role do the managers play at AA&A? Our managers set the investment policy with clients according to their personal situation, select stocks based on established policy, and execute purchasing and sales decisions in client investment-accounts. They are also directly involved in portfolio revisions and all discussions with clients. What role does the broker/trustee play? The brokerage firm executes trades according to instructions received from the portfolio manager (AA&A). The broker also acts as primary custodian for the investment accounts, ensuring that all services related to the regulation, conservation and administration of securities are properly executed. The broker also completes transaction payments, collects dividends or interest income and produces the monthly and annual taxation reports (T5, RL-3, and notices of assessment for registered accounts). Finally, the broker provides clients with Internet access to their accounts on a secured Web site. What do you mean by discretionary management? Based on the investment policies established by the client, we make sell- and buy-decisions for accounts under our management. Although the client is not directly involved in each decision, our managers are always available to discuss them at the client's request. How can I invest with AA&A? What are the steps? Just call us at 514.385.9001 to make an appointment with one of our managers. At the first meeting, the manager will explain the philosophy and past performance of the firm, as well as explaining their management experience. The first meeting or a subsequent one will also entail understanding your personal situation in order to establish the best investment policy for you. Is there a minimum amount required to open an investment account at AA&A? Yes. A minimum of $300,000 or more in assets is required to invest. Beyond this amount, no miminum monetary criterion is required for additional satellite accounts. Which types of account are managed by AA&A? Any type of account can be administered by AA&A. The most usual are RRSP, RRIF, personal, corporate, trust, LIRA, IPP, RESP, and TFSA. Can I access my account? Yes. Every client receives a monthly statement of account directly from the trustee, and a quarterly account statement from AA&A. Clients can also access their accounts on the trustee’s Internet portal at any time. What is the procedure to deposit or withdraw from my account? For all deposits, a cheque made out to the broker or trustee must be mailed directly to their attention. For a withdrawal, if the funds are available for distribution, the withdrawal is instantaneous (by cheque in the name of the client or electronically); if not, a sale is initiated and the money becomes available after 3 business days (settlement delay). How often can I meet and converse with the managers? The managers are always available for portfolio revision or to discuss a particular situation. Time is also put aside for an annual meeting to update and revise the client’s personal circumstances. Are the management fees income-tax deductible? Yes, the management fees are income-tax deductible for all non-registered accounts. It is therefore important to keep the quarterly bills for your annual income tax form. Can I use a broker other than RBC Dominion Securities or NBIN? For security and efficacy reasons we strongly recommend concentrating investment accounts in these first-class institution. Under exceptional circumstances, however, we are prepared to open an account with another establishment. 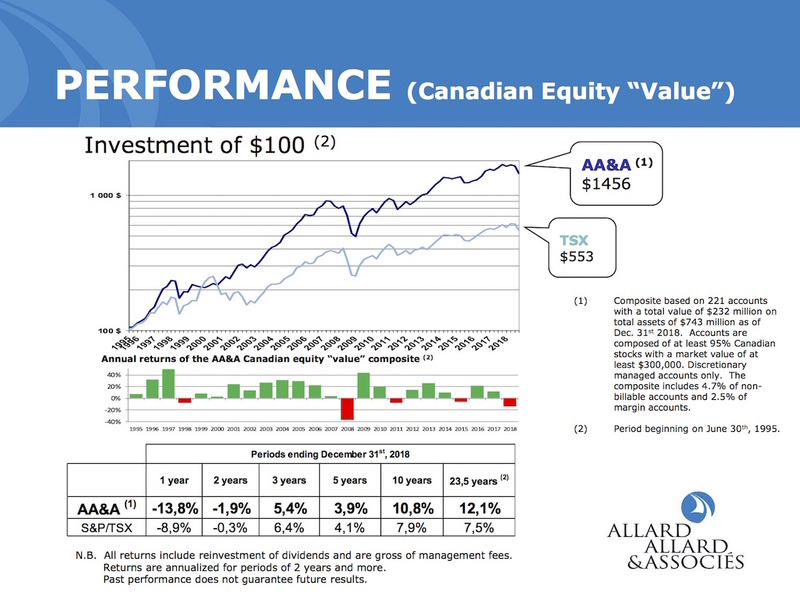 What is AA&A’s investment philosophy? Our portfolio managers follow the principles of the value-based approach developed by the father of fundamental analysis, Benjamin Graham, and followed so successfully by his renowned student Warren Buffett. Applying this method, our managers search first and foremost for fairly priced investments in profitable, quality businesses with a robust track record. We are particularly enamoured of dividend-paying stocks and long-term vision. 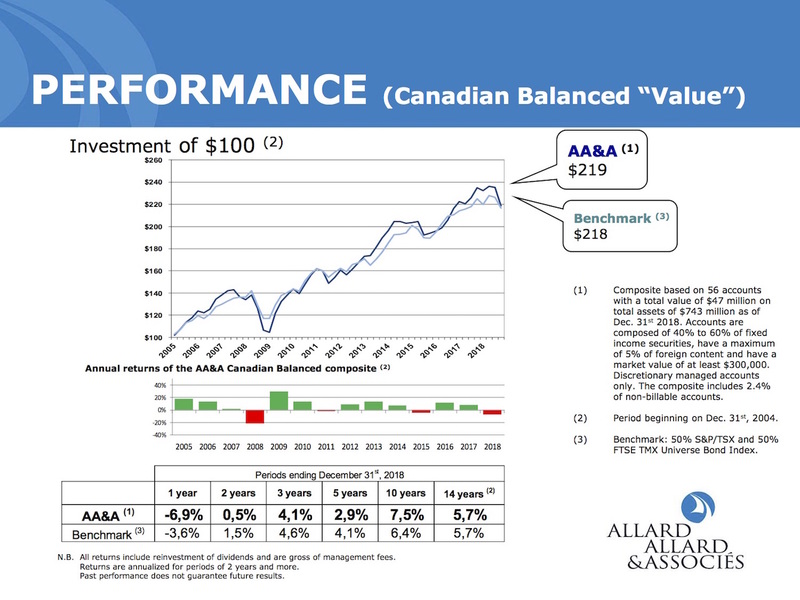 Does AA&A invest in fixed-income products? Yes. We invest a portion of the portfolio in fixed-income stocks like bonds, preferred shares and convertible debentures etc., as per the asset allocation established with the client. Based on the principle that each client is unique, AA&A establishes an investment plan after having meticulously analysed the client's situation, risk tolerance and needs. We can invest in ordinary stocks and/or fixed-revenue vehicles, depending on the management mandate. Furthermore, we are open to collaborating with our clients’ consultants – such as accountants, tax specialists or other advisors – in order to ensure the overall situation is optimised (planning, investment, accounting, taxes etc.). Who makes the decisions at AA&A? Portfolio managers make the investment decisions. An investment committee comprising our investment managers and analysts meets regularly to decide on the wisdom of maintaining any given stock, and to target attractive investment opportunities. In order to find the most promising prospects, our independent internal analysts constantly assess the market. All AA&A analysts hold the CFA designation and have significant experience in business valuation with the most current training. Do the managers invest in the same stocks as their clients? Yes. The personal investment accounts of our managers are also administered according to our distinct philosophy. Our managers hold the same investments as our clients. Are tax implications taken into account in the asset management? Yes. We always evaluate the income-tax repercussions of our decisions, whether they are for individuals or corporations. Moreover, we collaborate closely with our clients’ accountants to minimise income tax wherever possible. If you have a question to which you didn't find the answer in this FAQ, please feel free to use the fields on the left or to e-mail us.